St. Mary of the Nativity welcomes all parishioners to join in the joy and beauty of our Music Ministry. We have several choirs for both adults and youth. Anyone who likes to sing is invited to join. The gift of music and love of Gods words is shared in this wonderful ministry. Adult Choirs: All parishioners are welcomed and encouraged to join our adult choirs. You do not need to have musical experience - just a love of singing to join. The Adult Choir meets Wednesday evenings from 7:30 PM to 9:00 PM for rehearsal, and they sing at the Sunday 11:00 AM Mass (1st, 3rd, and 5th Sunday) and Saturday 4:30 PM Mass (2nd and 4th Weekend of the month) from September to May. If you have questions about the Adult Choir or would like to join, see the contact information below for Diane Dyson, our Director of Music. 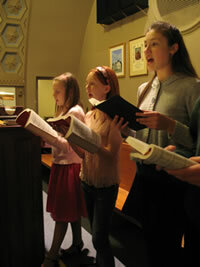 The Contemporary Choir meets for rehearsal on Monday evenings at 7:00 PM and sing every other Sunday at the 11:00 Mass. For more information about the Contemporary Choir, call Len Palmer at 781-545-8307. We also offer a Seasonal Combination Choir for the months of November and December finishing in January with Little Christmas, then again in February, March and April for the Easter season. This choir brings together all choirs for Holy Days and Sacramental Liturgies. Youth Choirs: Young people of the parish are invited to join St. Mary’s Youth Choirs. A better understanding of our faith and the Mass go hand in hand with the music ministry. Our Youth Choir truly adds to the celebration of the 9:00 AM mass on Sundays and we are always looking to expand and build on that talent. Rehearsal for the youth choir take place on Thursday from 5:00 to 6:00pm. The only requirements needed are the love of music and the ability to read. It is open to all students in grades 2 to 12. For more information feel free to contact our Music Director, Diane Dyson (see below), or just stop by the choir loft before or after mass.